Here's how to trade it. It's a little early to fill out the death certificate for the tech rally that's propelled the broad market higher all year long. Make no mistake - the past few weeks have been ugly for stocks. As I write, the S&P 500 is down more than 7.3% since the calendar flipped to October. That's nearly erased all of the upside in the broad market since the calendar flipped to 2018: On a price basis alone, the S&P is now up only 1.29%. Without a doubt, this correction is shaking out some weak hands right now. But it's critical to remember that - as of right now - we're still just in a correction. Zoom out to the last two years, and the S&P is still up more than 30% on a total returns basis, after all. Just as importantly, the tech rally looks like it's very much intact this fall. To figure out how to trade it, we're turning to the chart for a technical look at one of investors' favorite tech-centric indices. Want to Buy $1 Worth of Stock for 90 Cents or Less? You can with certain so-called "closed-end" mutual funds - an often overlooked investment class. Click hereto register for a free online video in which TheStreet's retirement expert Robert Powell and an all-star panel tell you all you need to know. 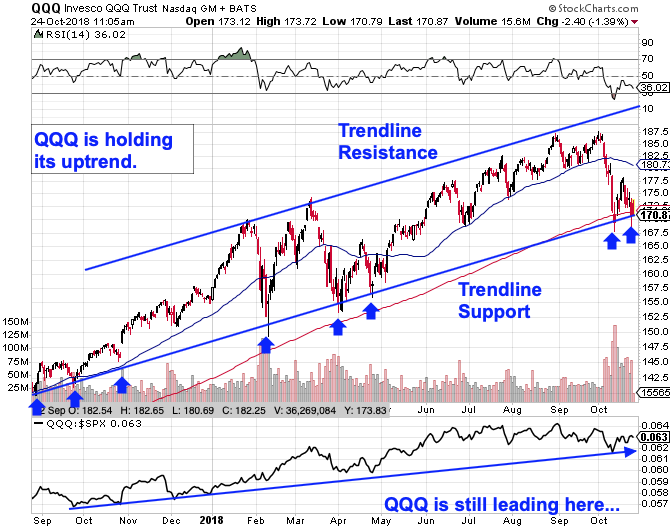 It doesn't take an expert technical trader to figure out that QQQ is still in an uptrend - at least for now. Shares are touching trendline support for the eighth time in the last five quarters, a level that's historically provided a stellar buying opportunity for the stocks in the Nasdaq-100. That's a bit of a double-edged sword. While QQQ has been a great buying opportunity at trendline support during this uptrend, that level also puts this popular ETF in make-or-break mode: If shares materially violate support, the uptrend is over and you don't want to own it anymore. For that reason, it's important to wait for buyers to re-assert themselves before piling into the tech trade this fall. If QQQ can catch a bid on test number-8, we've got a clear indication that buyers haven't relinquished control of the trend and more upside becomes a high-probability trade. Relative strength, the side indicator down at the bottom of the QQQ chart, adds some extra confidence to a move higher here. That's because relative strength has been in an uptrend of its own for the last year, signaling that the tech stocks in the Nasdaq-100 have been systematically outperforming the rest of the S&P 500 for a year now. QQQ is still leading the market despite the selling. If QQQ can stage a bounce off of trendline support here, then we've got a good signal that tech stocks are ready for the next leg of their rally higher.